Lionel Messi has broken a bone in his right arm and will be sidelined for about three weeks. Barcelona made the announcement on Saturday after Messi left their La Liga match against Sevilla in the first half at the Camp Nou. 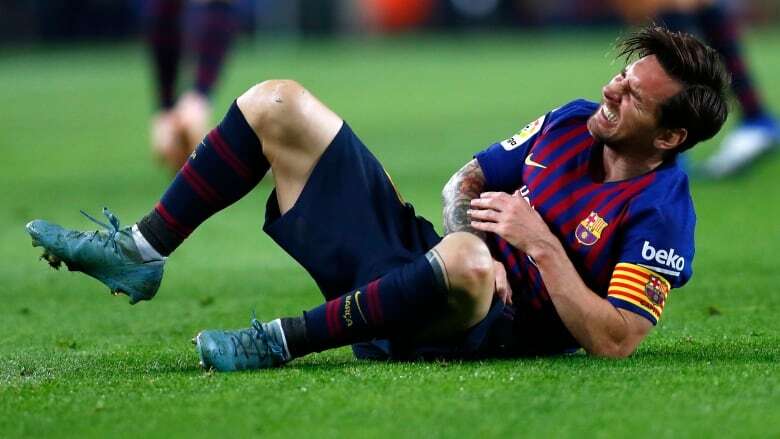 Lionel Messi broke his right forearm on Saturday and will be sidelined for about three weeks, a major setback for him and Barcelona right before some important games. Messi will miss playing Inter Milan in the Champions League on Wednesday, and El Clasico against Real Madrid next weekend. He'll miss three others, including the return game against Inter. "It's a significant loss. We will notice his absence," Barcelona coach Ernesto Valverde said. "We've played without him in the past. We will be prepared to overcome this." Messi was hurt in the first half of Barcelona's 4-2 win against Sevilla at Camp Nou Stadium. He was trying to reclaim the ball when he ran into the back of Sevilla midfielder Franco Vazquez and fell in the 17th minute. Trying to cushion his landing, Messi's right elbow bent badly. He was in visible pain and was treated by team doctors. They wrapped his elbow with bandages and the playmaker tried to continue, but he eventually left the field. Messi was taken to a clinic and the club said tests showed a "fracture of the radial bone." The playmaker scored the team's second goal with a shot from outside the area in the 12th. He's the team's leading scorer with seven goals in the league after nine matches. "We'll see how we will play without him," Valverde said. "We will try to maintain our style."